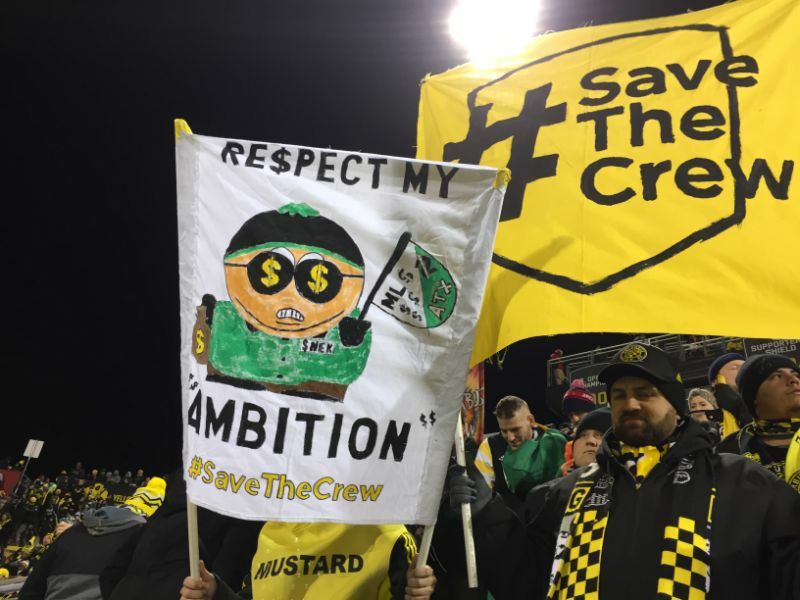 Over the last few weeks I’ve written two articles about the legal implications of Columbus Crew owner Anthony Precourt’s (almost certain) decision to relocate the franchise to Austin, Texas. In the first article, I examined what I termed Ohio’s Art Modell Act, Ohio Rev. Code § 9.67, and whether Ohio’s exercise of the authority granted under the Act to delay the relocation of the franchise would violate the commerce clause of the US Constitution. I decided that the Act likely did not violate the commerce clause, though obviously it would be a case of first impression so it would be impossible to say for sure. Then, I wrote an article based on a thought-experiment I had discussed with my law school friends Noah Baron (now a civil rights and constitutional lawyer in San Francisco) and Evan Mateer (now a law clerk in Texas and my co-host on Let’s Fix Football): could the state of Ohio use its inherent power of eminent domain to force Anthony Precourt to sell the Crew, either to the state itself or to another buyer? I concluded that while this would likely be an acceptable use of the power of eminent domain (under the broad public use doctrine established in Kelo v. City of New London, 545 U.S. 469 (2005)), it would likely be challenged and could lead to years of expensive litigation for Precourt, the state, and MLS. Mainly, I wrote that article as a thought experiment to gauge the reaction of everyday fans to the idea of socializing a sports team. The general reaction was, to put it mildly, fairly negative. In one sample email I received, a perturbed reader reminded me that the city of Oakland, California had tried to condemn its NFL franchise—the Oakland Raiders—in the early 1980s. The courts, the reader asserted, found that this was not an appropriate exercise of the power of eminent domain. In fact, the Court went even further, noting that because the power to condemn is an “inherent attribute of general government,” any constitutional or legislative provision can only place limitations upon its use—and, “no constitutional restriction, federal or state, purports to limit the nature of the property that may be taken by eminent domain." Id. Given that the California Supreme Court’s ruling in Raiders I generally supports my contention that a professional sports franchise is “property” within the meaning of the power of eminent domain (and the significant degradation of the doctrine of public use following Kelo in 2005), I stand by my argument that the state of Ohio could force a sale of the Crew under its constitutive power of eminent domain. So, the question I’m going to address is the same question that the California Court of Appeals (California’s intermediate appellate court) addressed in City of Oakland v. Oakland Raiders, 220 Ca.Rptr. 153 (1985) (we’ll call it Raiders II): whether the commerce clause prohibits a state from condemning a professional sports franchise. In Raiders II, the California Court of Appeals held that the proposed condemnation of the franchise would violate the commerce clause because “the burden that would be imposed on interstate commerce outweighs the local interest in exercising statutory eminent domain authority over the Raiders franchise.” Raiders II. I think it is worth re-examining the ruling in Raiders II with the Crew and MLS in mind—particularly because of the discrete and enigmatic interests at play, the different circumstances in Columbus in 2018, and the evolution of the doctrine of eminent domain since 1985. 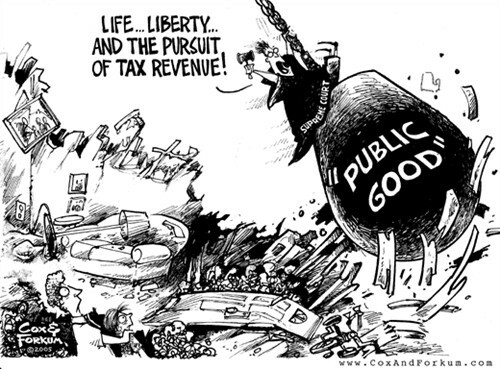 Eminent domain is not the most popular government power. To begin this discussion, we need to determine if the decision in Raiders II would control the action of a federal court in Ohio in 2018 (or later). The answer is patently, uncontroversially no. First, the California Court of Appeals is an intermediate state appellate court—which means its opinions wouldn’t even control in all of California. Second, it’s a state court interpreting the federal constitution, which means that any federal court opinion would outweigh it. Third, it was written in 1985, almost exactly twenty years before the US Supreme Court’s wide-ranging decision in Kelo. I think we can safely say that the decision in Raiders II would not control the actions of either an Ohio state court or a federal district court. However, I also think the decision in Raiders II would be used as persuasive authority, and thus needs to be treated with care (and not tossed aside). For several reasons, I think the court’s arguments in Raiders II might not apply to a potential Crew suit—so, for now I’m going to go through what I see as the most convincing arguments that a potential Crew condemnation would not violate the commerce clause (but, before doing this, I think I should note that because of the rarity of this type of case I don’t think anyone can be certain of the outcome of a potential litigation). In this case, the argument isn’t particularly clear—which is why I think it might be the state’s best case against commerce clause review. Deciding to condemn the Crew is not the same thing as passing affirmative legislation prohibiting the franchise from moving; simultaneously, condemning the Crew is not the same thing as purchasing the franchise on the open market. Because the Modell Act requires an open bidding process prior to relocation, the state could attempt to shield itself from commerce clause review by condemning the team after the bidding process concludes. That is, should the city submit the best bid for the franchise, it could condemn the franchise and award Precourt the amount of the winning bid; if the state does not submit the best bid, it could still condemn the franchise and transfer it to the winning bidder—interestingly, it is this second scenario that would most resemble the facts in the Supreme Court’s landmark Kelo decision (where the state transferred private property from one owner to another based on “economic development”). In fact, the state wouldn’t even need to submit a bid for the Crew at all (though the Modell Act specifically allows for it)—the power of eminent domain is broad enough to allow the state to act merely as a facilitator between two private parties. This was the specific case in Kelo and it represents the evolution of the doctrine of eminent domain since the California Court of Appeals decided Raiders II. Viewed as a whole, our jurisprudence has recognized that the needs of society have varied between different parts of the Nation, just as they have evolved over time in response to changed circumstances. Our earliest cases in particular embodied a strong theme of federalism, emphasizing the “great respect” that we owe to state legislatures and state courts in discerning local public needs. See Hairston v. Danville & Western R. Co., 208 U. S. 598, 606–607 (1908) (noting that these needs were likely to vary depending on a State’s “resources, the capacity of the soil, the relative importance of industries to the general public welfare, and the long-established methods and habits of the people”). 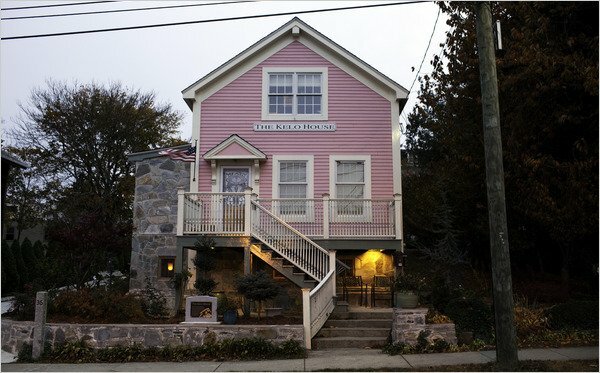 The "little pink house" made famous by the landmark eminent domain case, City of New London v. Kelo. Just like in other areas of state law, where the Court will normally defer to the state legislature in matters of state regulation, determinations of public use and eminent domain are matters for the state, rather than the federal judiciary. “For more than a century, our public use jurisprudence has wisely eschewed rigid formulas and intrusive scrutiny in favor of affording legislatures broad latitude in determining what public needs justify the use of the takings power,” Justice Stevens noted in Kelo. I think a lawyer smarter than I, then, could make a compelling argument that the power of eminent domain is so fundamental, so inherent to the concept of sovereignty that it deserves even greater deference than normal state legislation—including in discussions of interstate commerce. Because the power of eminent domain can be traced back to William the Conqueror, was codified in the Magna Carta, theorized by Hugo Grotius, and was so essential to American state sovereignty that early debates in the post-Ratification period centered on whether the Federal government needed State permission to exercise eminent domain, this power should be given special deference when limiting its use. This type of argument, could, at least, follow the progression of the Court’s evolving doctrine of eminent domain—but it would not by itself save a use of eminent domain from commerce clause scrutiny. Rather, it would provide the court an additional factor to weigh when determining the state action’s fate under the Pike v. Bruce Church, Inc. 397 U.S. 137 (1970) balancing test. Under Pike, a state or local regulation of interstate commerce will be upheld if it "'regulates evenhandedly to effectuate a legitimate local public interest, and its effects on interstate commerce are only incidental ... unless the burden imposed on such commerce is clearly excessive in relation to putative local benefits.'" Pike at 142. However, courts generally accept that "experience teaches that no single conceptual approach identifies all of the factors that may bear on a particular [commerce clause] case." Raymond Motor Transp., Inc. v. Rice 434 U.S. 429, 440-441 (1978)—so Pike balancing is quite complex and requires consideration of myriad esoteric factors. That being said, though, if this theoretical court were to reject the state’s argument that it was engaging in the market as a participant, then this last argument would really be a Hail Mary of sorts (to borrow a metaphor from the NFL). Most state action that gets to Pike balancing is going to be struck down, simply because there is either an alternative solution that is less of an imposition on interstate commerce, or the court will find that almost any imposition on interstate commerce is too onerous to uphold. It is to this second issue that I think the arguments about sovereignty could speak. The court in Raiders II argued that the use of eminent domain to condemn a sports franchise constitutes “the precise brand of parochial meddling with the national economy that the commerce clause was designed to prohibit” because the NFL is an entity engaged exclusively in interstate commerce and thus needs uniform national regulation. This is a powerful argument. However, I think a modern plaintiff could make the argument—an argument which was not raised in Raiders II—that the court should tread very carefully when overturning a state’s action based on eminent domain, one of the “inherent attributes of general government,” a constitutional element of sovereignty (a power that, by all accounts predates the ratification of the US Constitution). As the court in Raiders II noted, there is not one overriding factor that determines the outcome of a commerce clause case: in this instance, then, I think a smart judge, schooled in the history of eminent domain, would be bound to consider the implications (and wisdom) of asserting federal supremacy to overturn a state’s use of one of its most fundamental sovereign powers. To be clear: after careful analysis and a lot of thought, it seems clear to me that there are serious commerce clause issues with the use of eminent domain to condemn the Crew. These issues would be very difficult, if not impossible, to overcome. In this article I’ve tried to advance some theories that could allow a motivated judge to sidestep some of the thornier problems—though I do admit this is all basically a 90’+ cross into the box (so to speak). But sometimes those crosses are converted. I say “almost certain” because his company, Precourt Sports Ventures already owns the media rights for the Austin market, and has even set up an astroturf “fan” group which is encouraging MLS to move the Crew to Austin. “Condemnation is the "[p]rocess of taking private property for public use through the power of eminent domain." Black’s Law Dictionary (5th ed. 1979). This article uses the terms “condemnation” and “eminent domain” interchangeably. Please direct all hate mail to Evan Mateer, @evan_mateer on Twitter. See Martin v. City of Philadelphia, 420 Pa. 14, 18, 215 A.2d 894, 896 (1966) (noting that by operating and owning the team the city would be engaging "in the private business of promoting sports events"). Hugo Grotius, The Law of War and Peace 164 (Louise R. Loomis trans., Walter J. Black, Inc. 1949) (1625). See, e.g., the fascinating debate between William Baude and Christian Burset regarding the question of Federal eminent domain power in the post-Ratification era: William Baude, "Rethinking the Federal Eminent Domain Power," 122 Yale L.J. 1738 (2013); contra Christian R. Burset, "The Messy History of the Federal Eminent Domain Power: A Response to William Baude" 4 Cal. L. Rev. Circuit 187 (2013).